Islamabad: Biggest Media group in Pakistan Geo TV Network’s website hacked by Aaon Cop hackers group today. Hacking season is going on in Pakistan and World and today’s victim is Pakistan’s largest media group Geo TV network official website Geo.TV. Hackers group places some pages after defacement of geo.tv website and accused Jang group for supporting USA and leave some messages against renowned journalists Hamid Mir, Najam Sethi, Kamran Khan and ask them traitors. 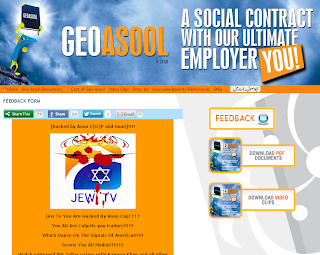 Hackers changed Geo Asool page and leave here a message in Asool section of geo.tv website. Below is message by hackers group placed on Geo TV website.